The Premium Guard product line is positioned as a leader in the automotive aftermarket filters. Premium Guard filters are manufactured to meet or exceed OEM performance, fit, form, and function. 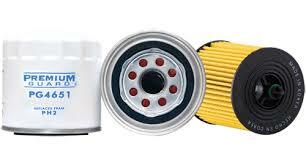 They offer near complete application coverage of automotive filters- Conventional, Extended Life Synthetic Oil Filters, and Bulk Pack Oil Filters. Precisely engineered for maximum oil flow and dirt holding capacity, Premium Guard Extended Life oil filters provide optimal engine performance and longevity as well as enhanced fuel economy. Utilizing synthetic resin media, the EX Series offers up to 10,000 miles* of engine protection with 99% efficiency.